Our Brentwood Sleigh Bed, though pictured in Oak with our Sanibel stain, can be personalized in any offered wood and finish found in the options menu. 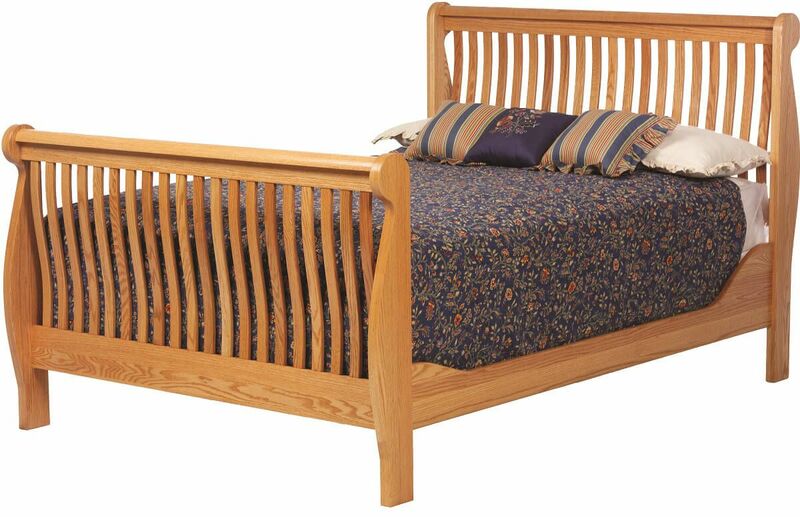 Handcrafted by our Amish artisans, the Brentwood Sleigh Bed boasts solid wood construction and durable joinery. A finishing process that includes multiple steps of sanding, staining, and coats of varnish is used on the sleigh bed. The slat ends of your sleigh bed are securely dovetailed into the side rails to prevent movement or slat fatigue. For Queen, King & Cal King sized beds, center legs are included for added support of your mattress beneath the slat. Using the options menu, indicate your preferred wood, size, and finish for the Brentwood Sleigh Bed. Contact us by phone, chat, or email if you have any questions while placing your order.